The recruitment of military veterans is a priority for the unionized sheet metal industry, especially on the training side. At Sheet Metal Workers Local 9 in Colorado Springs, the recruitment of veterans has been going on for more than a decade, and in November, the Department of Labor recognized the apprenticeship program’s effort and continued success. 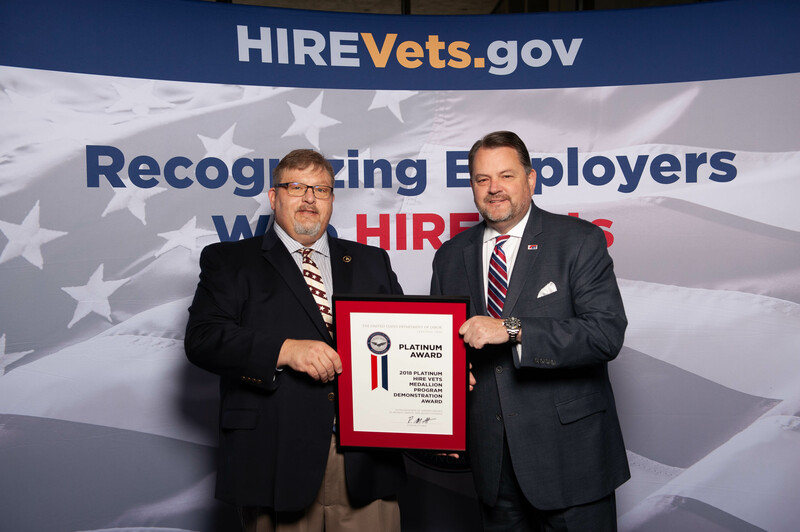 On Nov. 8, training coordinator Andrew Gilliland traveled to Washington, D.C., to accept the 2018 Platinum HIRE (Honoring Investments in Recruiting and Employing) Vets Medallion Program Demonstration Award. To date, the apprenticeship program is made up of 39 percent veterans, and while Gilliland recruits, he doesn’t specifically target veterans. The success is based off relationships formed with neighboring Peterson and Schriever Air Force Bases, the North American Aerospace Defense Command (NORAD), the Air Force Academy and Fort Carson. The partnership the apprenticeship program has with Mt. Carmel Veterans Services Center is another reason it was chosen to earn the platinum distinction. It gives veterans additional peace of mind. The brotherhood/sisterhood found in the union, along with the work environment, is primed for military veterans, Gilliland said. Many times, service members don’t know how to transition infantry, tank and scout skills to a new civilian career. Gilliland calls the higher-than-average veteran population in his apprenticeship an “organic occurrence,” due to the number of military bases in the area. When veterans walk through his door, wanting to head for their hometowns, Gilliland gets on the phone to the training coordinator in that area. Actively recruiting veterans is something all coordinators can do in one form or another, he said. The Department of Labor established the program under the Honoring Investments in Recruiting and Employing (HIRE) American Military Veterans Act, which was signed into law in May 2017. For additional information, visit https://www.hirevets.gov. More than 14,000 apprentices are registered at over 150 training facilities across the United States and Canada. The International Training Institute (ITI) is jointly sponsored by SMART, the International Association of Sheet Metal Air, Rail and Transportation Workers (formerly the Sheet Metal Workers’ International Association) and the Sheet Metal and Air Conditioning Contractors’ National Association (SMACNA). For more information about ITI and its available training curriculum for members covering sheet metal trade work, visit the website or call 703-739-7200.